Durable, easy to use, and packed with big business functionality, the M5900 portable data terminal is an ideal solution for everyday, all day data collection applications - including inventory control, factory floor management, price verification, shipping/receiving, asset tracking and more. Each M5900 Series portable data terminal includes all the software development tools required to quickly and efficiently put the portable data terninal to work in your business. 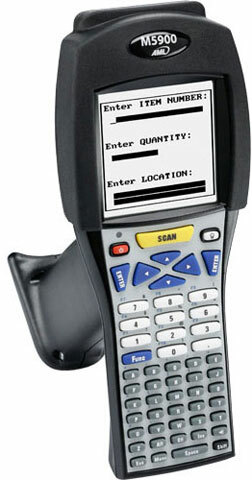 The M5900 terminal is preloaded with six everyday data collection applications that give you the capability to scan barcodes and collect basic data. M5901-0111	 M5900, Batch Kit, 1D Laser, Pistol Grip, Numeric Keypad, 32MB/16MB. Includes USB cable, Battery, and Program generator. Charger not included. See accessories. SVC-EWP5900	 AML Service Contract - 3 year, M5900 Extended Warranty Plus "No Fault" Coverage For External Components. The AML M5901-0111 is also known as American Microsystems	AML-M59010111	or M59010111	.